Meteorite identification is tough enough for the inexperienced. Too often a suspect meteorite is taken to a well meaning authority figure such as a geologist or science teacher who has only read enough on the subject to convince himself to speak as an authority. I called Mr. Bhattacharyya at the Discovery Science Center (1/11/08) and asked if he did a nickel test. He replied that it was not necessary because of the presence of the 'widmanstatten pattern'. (If anyone can actually see a widmanstatten pattern in the photo please contact me) I informed him that due to his judgment, a suspect item was being sold as a genuine meteorite on eBay. I related my concerns that a newbie bidder may purchase a meteorwrong thinking it is genuine (owing to 'expert validation') only to become disillusioned with collecting and thus leave the hobby (not to mention the seller's predicament). Mr. Bhattacharyya agreed but held secure in his opinion of the item below. 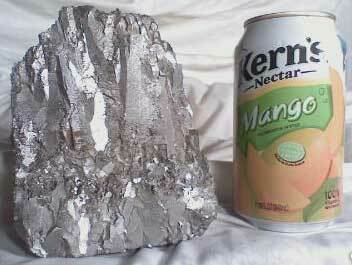 I later learned from the owner that the item has a weak magnetic attraction proving this is not an iron meteorite. This basic test was also overlooked. Why? After being informed that the item is suspect, the seller appeared inclined to pursue definitive identification. However, the seller did not pull the auction or alter the Title/Description to warn potential bidders of any controversy. On Jan. 14, 2008, the seller lowered the initial bid on the suspect item from $10K to $1.5K. The auction ended with no bids. On Jan. 18 , the seller 'jrtxtwo' relisted the item starting at $500 with no change to the Title or Description. On Jan. 19, seller lowered the starting bid on the item to $400. On Jan. 20, seller changed Description to "please do not bid on this item' and raised min. bid to $1M. 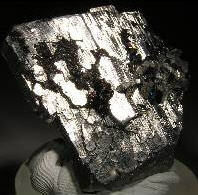 After receiving Norbert Classen's warning that this may be arsenopyrite (below), I shared his concerns with the seller. Before the auction quietly ended the seller added this explanation to the Description: "please do not bid on this item it might be a poison arsonic. I cant figure out how to end this auction so I put a big price tag on that nobody in there right mind would bid on. so please no more smartass questions of all you so called scientists. I took this to A scientists that works in A real museum not A so called scientist that got his degree online that runs around the desert with a metel detector finding meteorites just to sell on ebay. thanks for looking and happy hunting." I have no explanation for the seller's last comments especially when said 'scientist that works in a real museum' provided an incorrect opinion that was the basis for this auction. True, the seller thought he was contacting professional help at this children's museum but a lay person actually experienced with meteorites would have provided much better advice, in my opinion. 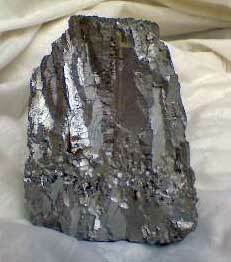 "Hard to judge from the pictures, but this could be arsenopyrite or another similar (of course, terrestrial) sulfide. 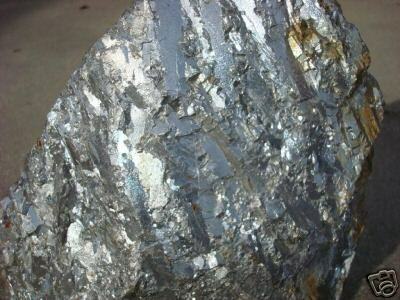 It's dangerous if you cut such stuff without wearing a mask, and we had one guy in Germany who thought he had a meteorite, cut it, and ended up in hospital due to a heavy arsenic intoxication. Buyers beware!" This different auction also appears to be the same type of material. The seller reports that he sent the item to a university to determine its identification. Where can you take your suspect meteorite for verification? 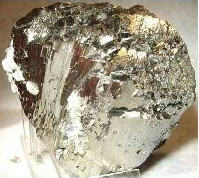 Meteorite classifying institutions will examine your specimen in most cases for free!! 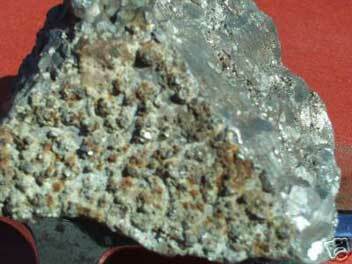 Anyone can make a claim that they have found or own an authentic meteorite. It is entirely another matter to offer satisfactory proof of verification or classification from a Meteoritical Society approved institution. 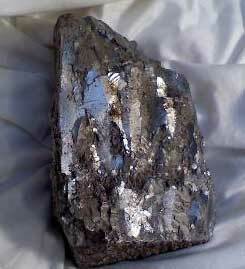 The photos or auction #'s on this page may link to meteorite auctions. In the opinion of this author, these auctions may lack either proper verification, credible history or photo, or reasonable supposition to qualify. This does not mean that they are not meteorites, only 'suspect' in the opinion of this author.